Indians Baseball Cards: Dinged Dinged! And in this Corner(s), NightOwl! The other day, I received a gift pack of my own from Patricia and the girls at Dinged Corners! Some time ago, she had a post describing an Indians card she had, and through a series of high-level meetings, a deal was inked that had cards being traded for other cards among several card bloggers, and when all was said and done, I ended up with a VERY nice auto from DC! Before I get to that though, I opened the package to find Julio Franco in triplet! Julio is one of my all-time favorite players from that era! Wahoo!! 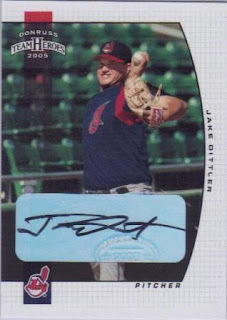 Of course, the main attraction of the pack is the 2005 Donruss TeamHeroes autograph card of Jake Dittler! THANK YOU very, very much, Dinged Corners for some great cards!! I am going to take the words of your note and redirect them back to you, "thank you for always making trading fun!" On the same day (or I think it was the same day), I received a bonus item from NightOwl! 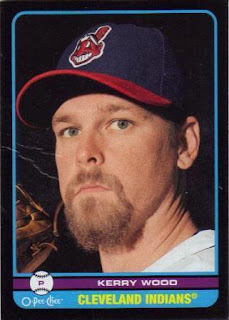 How about a 2009 O-Pee-Chee Kerry Wood!? So far, it appears the youngster was checking the Woot of the day, and somehow the card ended up as the seating cushion. I still don't have all the details, but I can assure you justice will be served - most likely in the form of office-cleaning child labor. Thank you, NightOwl, for a very cool card! For those that don't know - I'm kidding about the justice thing. I collect Indians cards, condition is never a factor - whether the arrives having previously sat upon or becomes that way while in my possession - either way, I'm a happy collector just to have received the card(s) in the first place!! Whew, that's a relief (I guess). I thought our friendly U.S. postal system had damaged the card. It's a nice-looking card anyway. The crease goes nicely with the shaggy goatee.